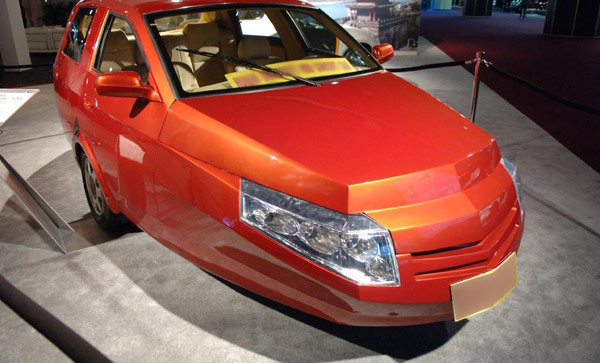 Just By Looking At It"
"The Rhombus, which was built by Changfeng College of Automotive Engineering in China, has its wheels arranged in a diamond shape, with each pointy end supported by a single wheel and two wheels in the middle." Such wheel placement could be an advantage - the front and back wheels turn simultaneously, thus giving the car really short turn radius. 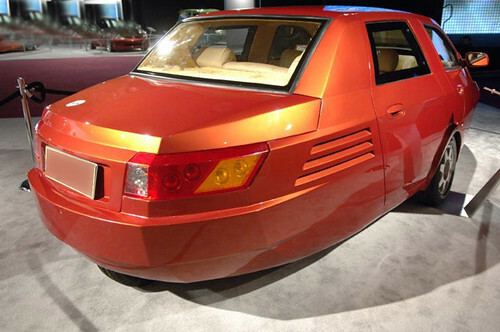 The concept was in the making since 1990, and finally was shown at Detroit auto show this year. 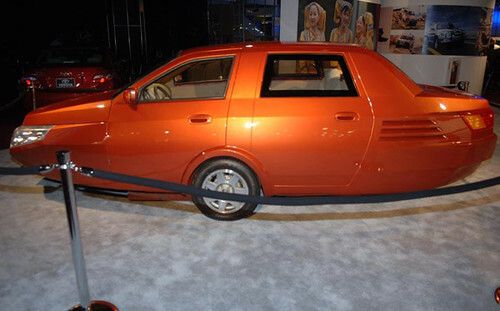 Even though it can easily win an award "The Ugliest Car of the Year", it definitely makes a most audacious engineering statement. ...and in case you ever wondered what is OFFICIALLY "The Ugliest Car Ever Built?" "Safety features" of this car included (then rare) seat-belts, a roll cage, side-impact bars, a collapsible steering column, and a padded instrument panel. 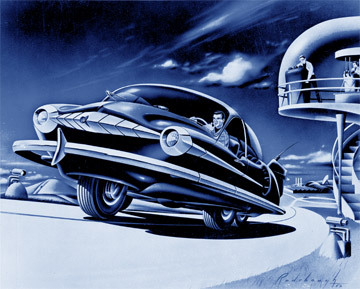 The most innovative safety feature, which has not been incorporated into other cars, was the ability to swivel the seats to face rearwards should a collision seem imminent." That is one fu*cked up looking car in a really bad way. Looks dated as a matter of fact. Looks like it would have been a concept car in the late 80's. This is a WILD Failure. Wow. Nasty, nasty, nasty! This is why the Chinese don't design for themselves! Is this sleeper or a shoe? 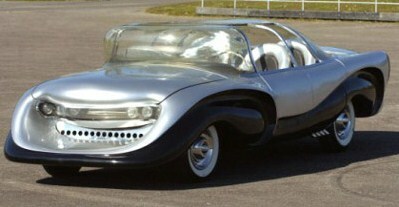 This got to be the Ugliest of the Ugly concept I have ever seen. 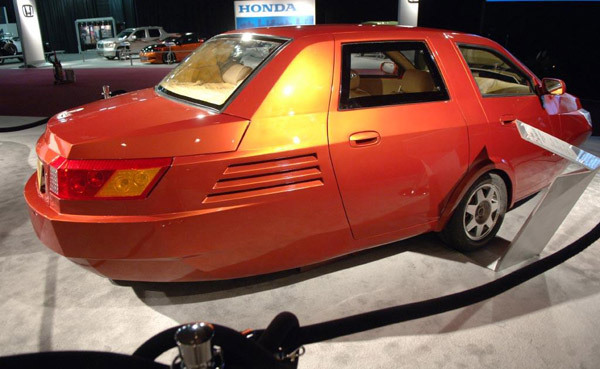 Congratulation to whomever design this concept for winning the Ugliest concept car award. I first saw this concept in Design News mag. for 11/23/1959.It was called the Prvenac [The "First"]and was designed by Prof. Ing.Nestorovic, head of Mot. Veh. Dept, Faculty for Mech. Eng'g., Belgrade, Yugoslavia. 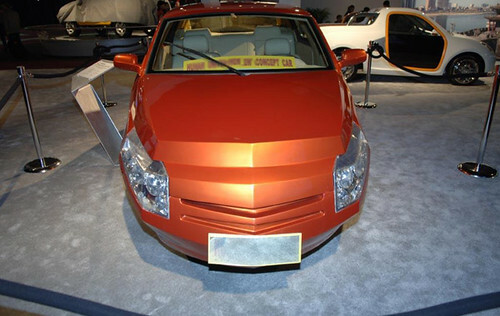 the design was simple [elliptical]and ugly but only in a '50s sort of way and all things considered, not so offensive as this flashy Chinese model. I have 2 top views of the body, and 3 pics of the Chassis. looks to be easily homebuilt. Just one aspect of the design I didn't understand, or I might have tried putting one together.